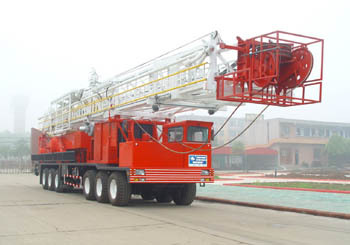 It is the biggest single engine truck- mounted drilling rig, and is of greatest operation performance and most practical model in drilling work within 6,560' (2000m). The users can choose single drum or double drum, and also hydraulic disc brake, air disc auxiliary brake system and emergency power system are optional. It is the best choice for drilling operation of medium depth and shallow wells.